The year in retrospect: For those that follow my web site, you know I have been goofing off and not updating it as I normally do, so I am catching up with this page. 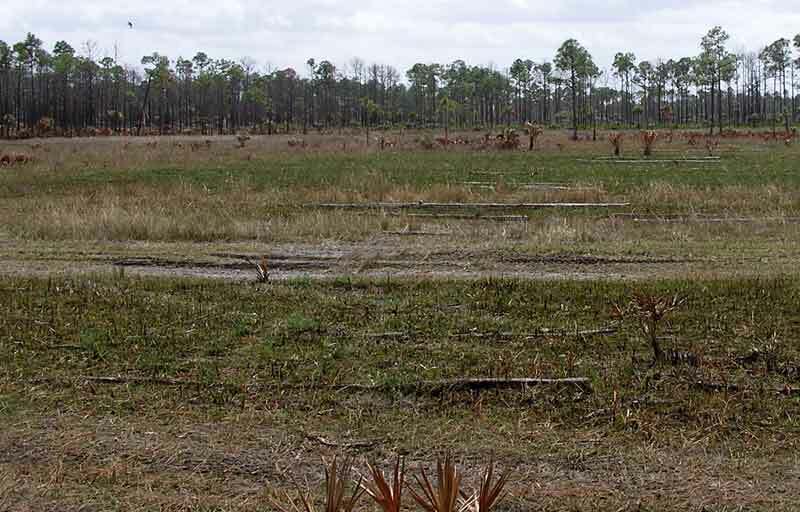 The picture to the left, taken in February is not an unusual picture of a swamp buggy, but one you don't like to see. 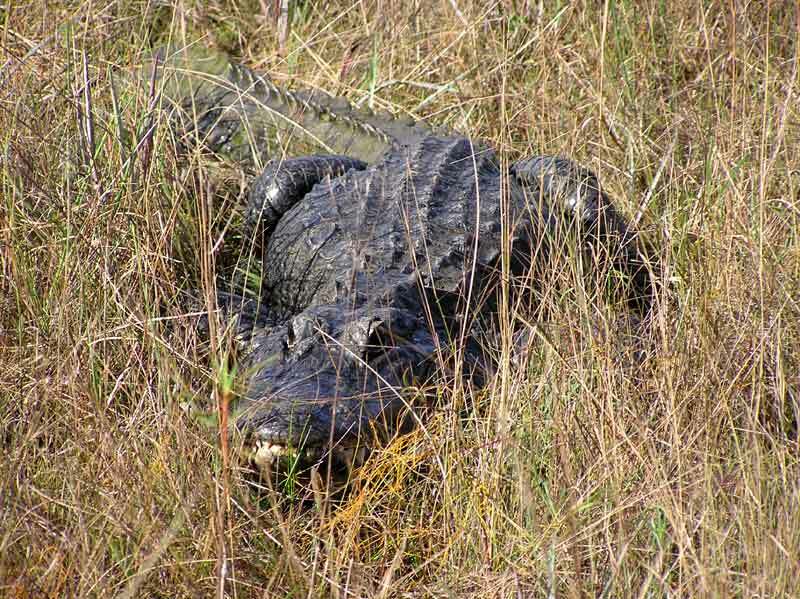 A tire laying on the ground is never a good thing in the swamp. This time it presented an opportunity for camp owners and friends to meet in this impromptu place. 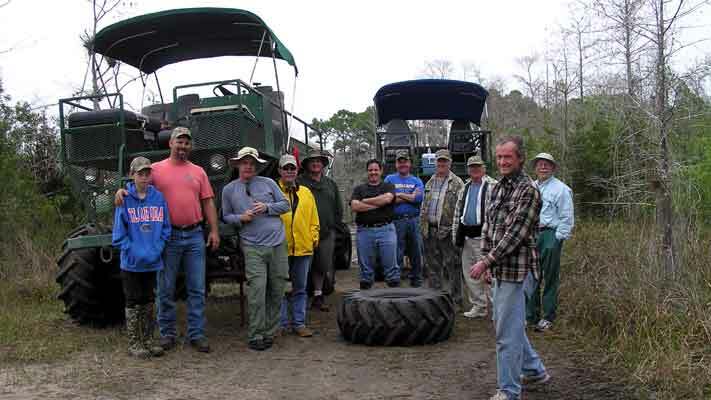 Near Ronnie's Pond Gladesmen gathered to see if assistance was needed, with a not really broken buggy. Its an old swamp law that you never pass a fellow Gladesman in trouble, so soon traveling gladesmen stopped to help and old friendships were renewed. 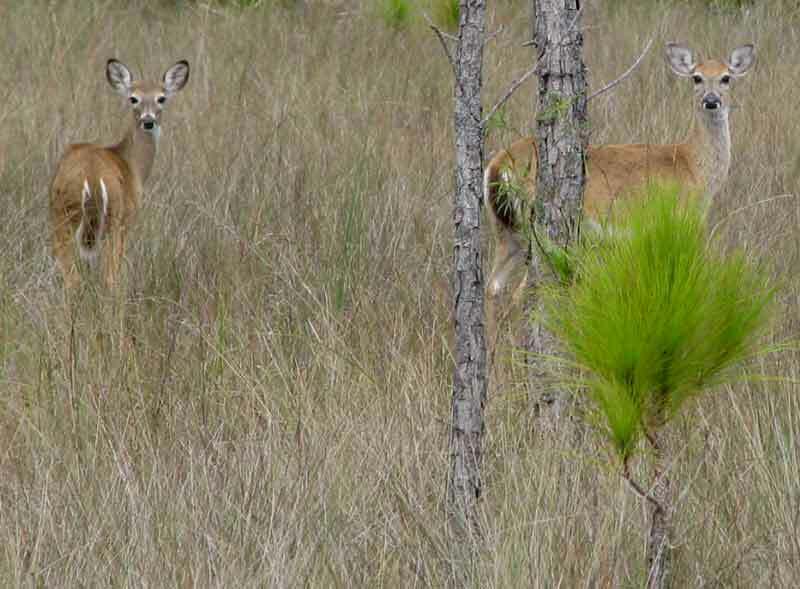 A couple of swamp deer observed our passing by on our trip to Tony Lepri's Memorial service, in March. It seemed even the deer could sense the passing of a ole adversary. 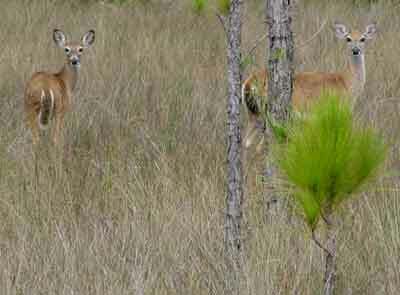 We saw more deer on this trip, then we normally do. It was as if they assembled along the way to say goodbye to a familiar Gladesman. We had a memorial service for Tony Lepri, our friend and fellow Gladesmen, whom for his whole adult life had accompanied us to the Big Cypress and camp SixPack. 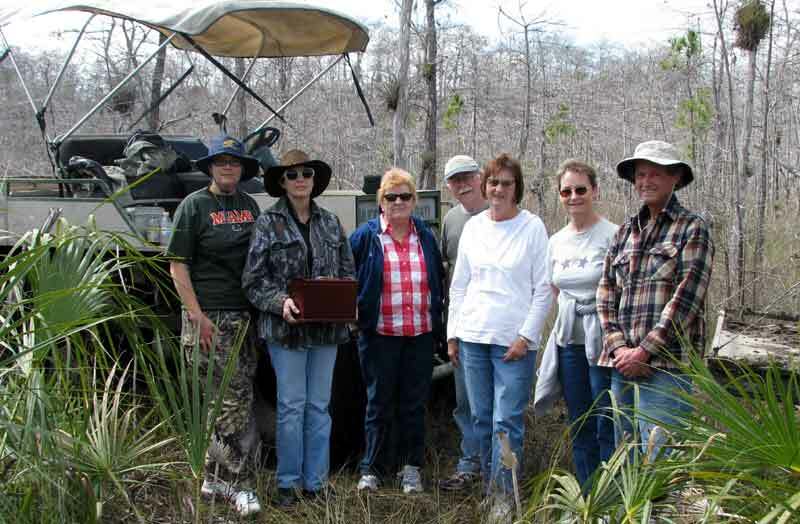 His Daughter, Wife and small group of friends traveled to his favorite hunting spot in the Big Cypress Swamp for the service. This trip was a first for Tony's daughter and wife and also for Hoss's wife and my wife also. They had always left the trips to camp as the guy's time to enjoy each others camaraderie. 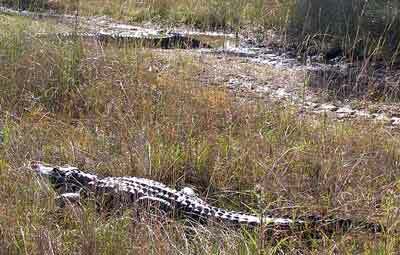 Tony is resting in a place he enjoyed, where he can watch the deer pass by along with the other animals of the swamp. A near by camp will provide the smell of coffee perking on the morning stove, as he listens to the footsteps and noises of the swamp. Can a Gladesman ask for more, the simple things in life after all, are the most enjoyable. What you see in the picture is the cypress logs left over from the Logging Tram on Buckskin Prairie. 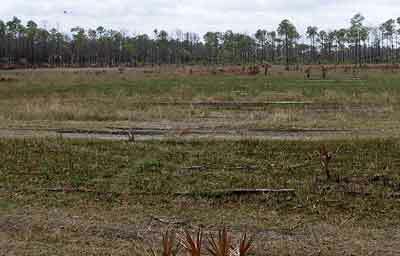 A national park prescribed burn in February, revealed several of these tram trails. They radiate outward like the spokes of a wheel in this area. In just a short period of time the grasses will hide them again, from the casual view. Hidden again from sight and history of the Big Cypress Swamp. The NPS has no qualms about moving these logs out of the way for their designated trails. No need to preserve history here, I guess. In February, the NPS fire group did a prescribed burn in the area of the Little Deer camps. My experience with these guys tells me they are a bunch of great guys (and gals). 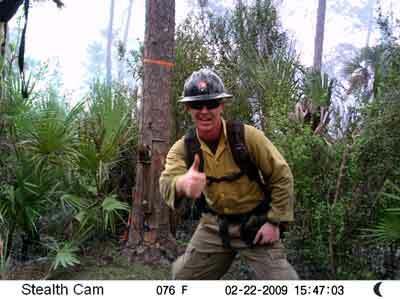 The fire fighter in the picture had removed and just re-mounted my game camera under the game feeder, so they would not be damaged by the prescribed burn. In the background you can see the smoke from the fire. To the NPS firefighters, Thanks for the prescribed burns and protecting my equipment. A prescribe burn brought this pile of junk to visibility again. It is interesting that the NPS private landowners Q&A guide states that when a private property is purchased it is the new owners responsibility to clean up any discarded junk on the property. In the NPS typical "do what I say, not what I do" fashion, they have left this junk on the property they acquired more then thirty years ago. 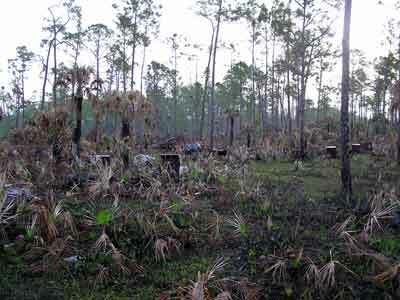 Every three or four years they do a prescribed burn exposing their negligence. While there are easily a half a dozen piles of junk like this in the area, this one sits right beside a designated trial for all to see. In this picture it is spring turkey hunting season, while heading back to camp, I came across a pair of alligators traveling together. March is also the alligator mating season and this pair was heading home after a romantic night out. I don't know which is the male and which is the female, but they both had a smile on their face. The one in the foreground did not like being interrupted at all and kept giving me that growl and blowing up hissing they do to let you know they are unhappy.